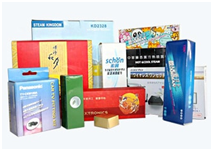 Offset printing boxes are made of cardboard or micro-corrugated cardboard with various colors. They help consumers knowing the goods better for the strong attraction. Available in different papers: duplex paper, craft paper, copper, gold card, silver card etc. Can be made different paper qualities. Can be made with / without lamination. Can be made in different types: barrel boxes, aircraft boxes, with window, with handle etc.